Tiger Woods romped into the first-round lead as he renewed his rivalry with defending champion Padraig Harrington at the USPGA Championship. Woods shot a bogey-free five-under 67 to set the early clubhouse target which proved impregnable at Hazeltine. Ireland's Harrington, second to Woods last week, carded 68 alongside the American in kind morning conditions. Former champions Vijay Singh and David Toms ended in a share of third at three under late on day one. The 46-year-old Singh, the 1998 and 2004 USPGA champion, and 2001 winner Toms were the pick of the afternoon starters in a stiff breeze, joining Australians Robert Allenby and Mathew Goggin, American Hunter Mahan and big-hitting Spaniard Alvaro Quiros in shooting 69. Woods, who beat playing partner Harrington by four shots in a tense final round in the WGC event at Firestone last week, is aiming for a record-equalling fifth USPGA title - to match Walter Hagen and Jack Nicklaus - and a 15th major in all. He hit 12 of 14 fairways to equal his best USPGA performance and sank five birdies on the 7,674-yard layout, the longest course in major golf history. "I'm very comfortable with how I'm playing," Woods said. "I hit the ball well pretty much all day. I hit a lot of good putts. They were hitting the edge and staying out. This round could have been a really low number." 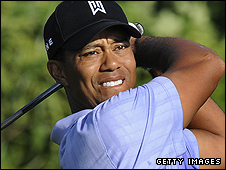 Woods, who missed the cut at last month's Open and shared sixth at the Masters and US Open, has won five times since returning from knee surgery in February, including twice in the last two weeks. But this will be the first year since 2004 without a major title for Woods if he fails to lift the Wannamaker Trophy on Sunday. "I've got to keep plodding along. I just have to be consistent," he said. "There are times I've got it together and had some comfortable margins of victory. "When I put it together, I don't make many mistakes. I enjoy battling with Padraig and hopefully we'll play well again on Friday." Harrington, who took a triple-bogey eight on the 16th at Firestone when leading by one, carded a single bogey alongside five birdies as he seeks to defend the trophy he won in Woods's absence last year. "I tired a little at the end, but the rest of the day I was quite strong mentally," said the three-time major winner, who struggled earlier in the season after making swing changes. "It's a good golf course here and at the moment they are giving us opportunities to score birdies as the pin positions are quite generous. "But there is a lot of intimidation out there and it's going to get a lot harder." On his burgeoning rivalry with Woods, Harrington said: "The great thing when you play with Tiger is that you know you're going to have to play the shots. "It puts you under more pressure and you feel like you might as well go after it rather than hang back. It actually helps you focus and you know you have to be on your very best form. It motivates you to play well." Northern Ireland's Graeme McDowell and England's Lee Westwood ended in a group on two under, while Northern Ireland's Rory McIlroy, Spain's Sergio Garcia and Englishman Luke Donald were one stroke further back. England's Ian Poulter was two under after 16 but bogeys at his final two holes dropped him to level par for the round. World number two Phil Mickelson, under-prepared as he cares for his wife and mother who both have breast cancer, worked hard for a two-over 74. "I had a terrible day putting. I haven't putted this bad in a long time," Mickelson said. "I felt it should have been somewhere in the mid-to-high 60s. If I don't throw away those little three-footers, I'm a few under par." Colourful American John Daly ended with consecutive double bogeys for a 78 but immediately withdrew, citing back problems. The former USPGA champion has lost 36kgs (six stone) in four months after being fitted with a gastric band but is struggling with his game and shot an 88 in his previous round at the Buick Open. 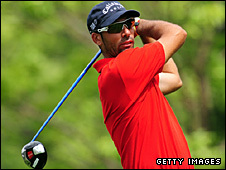 Quiros, the longest driver on both the European and PGA Tours, showed that his length might give him an edge at Hazeltine as he reached the green at the 606-yard par-five 11th in two shots - the second with a driver - while Woods and his group were putting. "He apologised," Woods said. "Nothing to apologise for. It was phenomenal."